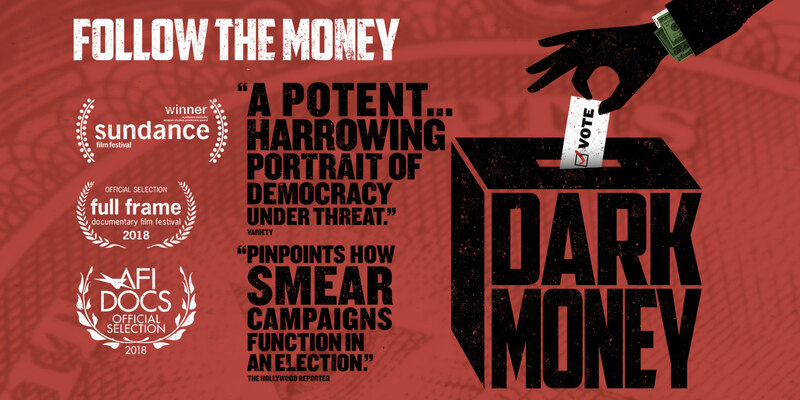 Kimberly Reed's documentary examines one of the greatest present threats to American democracy: the influence of untraceable corporate money on our elections and elected officials. This political thriller film takes viewers to Montana. a frontline in the fight to preserve fair elections nationwide, to follow an intrepid local journalist -- John Adams -- working to expose the real-life impacts of the US Supreme Court’s Citizens United decision. Through this gripping story, Dark Money uncovers the shocking and vital truth of how American elections are bought and sold. This Sundance award-winning documentary is directed/produced by Kimberly Reed (Prodigal Sons) and produced by Katy Chevigny (E-Team). "Beyond Russian interference in our elections," writes Anne Thompson in IndieWire, "what conservative interests are doing to control policy state by state is bone-chilling. But Reed also shows how citizens can effectively fight back. 'It’s a long game,” said Reed. “For me it’s all about disclosure. Even within the Citizens United decision, the only reason we can spend unlimited money is because we have to disclose and know where the money is coming from. It’s mandated by Citizens United, it’s the law of the land. There’s our solution: being able to follow the money, showing how it happened in Montana, which many people think is an unlikely place for campaign finance reform. We have to make sure that what happened there can happen anywhere.'" Kim Reed's work has been featured on The Oprah Winfrey Show, CNN, NPR, The Moth and in Details magazine. One of Filmmaker Magazine's "25 New Faces of Independent Film," she directed and produced Prodigal Sons, which landed on many best of the year lists, screened at more than 100 film festivals and garnered 14 audience and jury awards. Reed was recognized as one of Out magazine's "OUT100." She also produced, edited and wrote Paul Goodman Changed My Life and produced The Death and Life of Marsha P. Johnson. Reed is a fourth-generation Montanan. See Dark Money Facebook page here. Our event is sponsored by Film and Media Studies, Film and Video Studies, DKA (Delta Kappa Alpha), Global Affairs and Global Programs, History and Art History, GMU Student Power, English, AAUP (American Association of University Professors) @ Mason, Transparent GMU, University Life, Women and Gender Studies, CHSS Interdisciplinary Curriculum Collaborative, and Honors College.